San Jose Police Activities League Football and Cheer Board, Presented Long time support & Board Member Officer Juan Reyes with multiple gifts to thank him for endless hard work. Tonight Juan Reyes was presented with a Plaque thanking him for his 20+ years of dedication to the youth in our community. 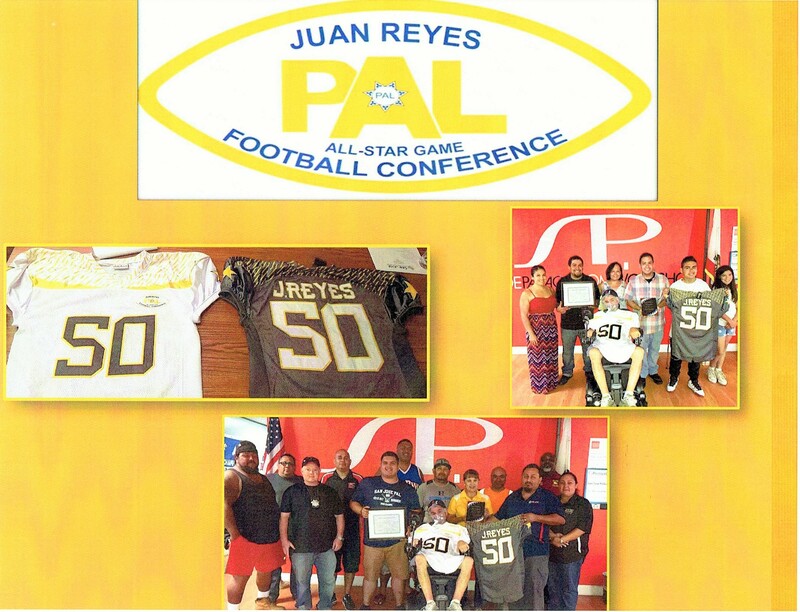 Also Football & Cheer Commissioner Louis Garcia, PAL Sargent Tommy Boyle, and PAL Football President Unveiled to Juan that in April a unanimous vote was passed to rename the SJPAL All-Star game to The Juan Reyes PAL Football & Cheer All-Star Game. Juan was presented with both versions of the Jerseys players will wear in November during the games. Tonight Juan was accompanied by his wife Yolanda, daughter Jessica, son Juan Reyes JR, son Marco, grandson Derek Rodriguez, and niece Isabella Acuna to help celebrate with amazing dedication.